Metrotile Lightweight Steel Roofing has always been considered a versatile product, suitable for countless rooftop applications. Specifiers are often surprised by the many benefits Metrotile Lightweight Roofing has to offer, leading to Metrotile roofs appearing on a variety of interesting and occasionally niche projects. This trend continued as Metrotile was specified for various fire station training buildings by Devon & Somerset Fire and Rescue Service. Mark Tribble, the service’s Project Surveyor, has chosen Metrotile for training construction roofs for nearly ten years. In his role Mr Tribble oversees the building of training facilities, seeking to make each suitable for as many training scenarios as possible. Mr Tribble states:“We look at Metrotile in addition to alternative roofing products for specification on training buildings. 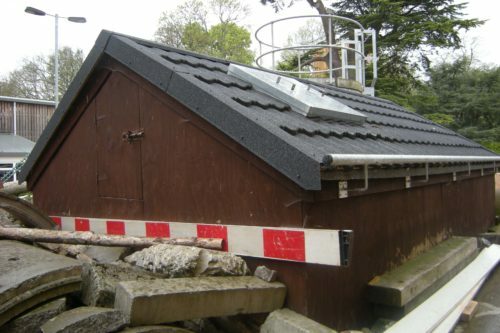 The first Metrotile roof can be located at the STC (Service Training Centre) in Plympton on a live fire training and ladder drill building known as ‘The Doll’s House’. Metrotile roofs can also be found at six other stations including the Exeter HQ. Find out more about Metrotile and specialist projects here. For further information about Metrotile Lightweight Roofing, visit our contact page. To download from our library of informative documentation and certifications, click here.